GRAFENWOEHR, Germany — Environmental Division’s Stefan Haertl, along with Hubert Anton from Bundesforst, Germany Federal Forest Service, and Dr. Daniel Schmidt-Rothmung, eagle expert from Germany’s primary nature conservation organization Naturschutzbund Deutschland, recently banded a fledgling white-tailed eagle in the Grafenwoehr Training Area. Bird banding is critical for studying birds because important information can be gathered, including their behavior, movements and survival. “Eaglets are handled when they are still unable to fly, and two metal bands — one gold and one black — are attached to the lower legs. These bands are marked with letters and numbers, and the number is recorded into a special database. In this young eagle’s case, it will now wear the code AW21,” said Stefan Haertl, Environmental Division staff member. During the banding, the bird’s weight, win measurements, age and location are determined. The data is recorded and tagged with the band number. If the bird is ever captured, killed or spotted through a viewing scope, the band number can be used to learn more about the eagle’s life and habits. 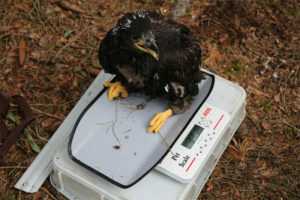 This young eagle weighed 3,950 grams and is 6 weeks old. Dr. Schmidt-Rothmund scaled a 30 meter tree to take the young raptor out of the nest and very carefully hoisted the bird down in a cloth sack. The crew worked quickly to keep the bird from getting stressed, wrapping up the procedure in a fast 45 minutes. The eagle was safely returned to its nest in the treetops. The Environmental Division and Germany’s Bundesforst are responsible for monitoring white-tailed eagles in Grafenwoehr Training Area. This year there were two nesting eagle pairs, but only one nest was successful. It is typical for white-tailed eagles to have only one or two offspring per year. “The white-tailed eagle’s population plummeted due to over-hunting, the use of DDT — which causes egg shells to weaken and break — and habitat loss. But in recent years, we have seen a population increase due to conservation efforts. Grafenwoehr Training Area has been an essential stepping stone for re-establishing the white-tailed eagle population in Bavaria. These magnificent birds require little to no human disturbance for raising their young and remain relatively undisturbed by military training activities,” said Stefan Haertl. This is one of many examples of how military training lands positively impact wildlife populations.